ASPA Member Logo for your website. Show everyone that you're a screen printing professional. 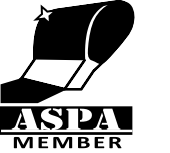 Place the ASPA Member badge on your business website. Below is the ASPA Member logo for placement on your website. Choose a logo/size that works best for your website.